Leeds is in Washington County, near I-15 northeast of St. George, just a few miles southeast of the Pine Valley Mountain Wilderness Area of the Dixie National Forest and Quail Creek Reservoir. Leeds is an outgrowth of nearby Harrisburg. 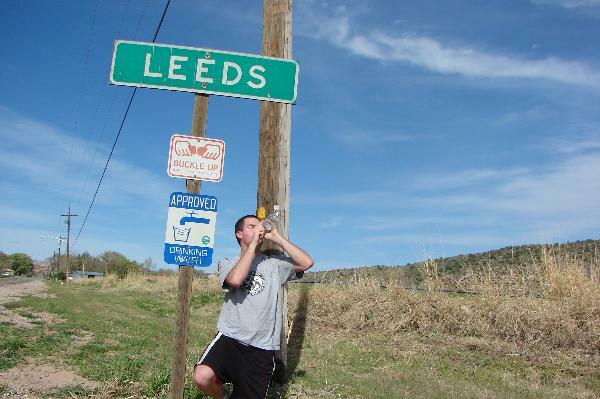 In 1867 settlers came from Leeds, Yorkshire, England to settle the area. An early name was Bennington in honor of the local LDS presiding elder. It was he who suggested the name be changed to Leeds. Leeds also played an important role in providing jobs for young men who were housed here during the depression years and given conservation work, such as flood control, water resource development. They built roads and bridges and were involved in the construction of the Zion Park tunnel. Hence, the Leeds CCC (Civilian Conservation Corps) Camp was constructed in 1933. The project housed ca. 250 men in buildings constructed of wood and stone. By 1950 the frame barracks had been removed. Today, only a few of the original stone structures remain.